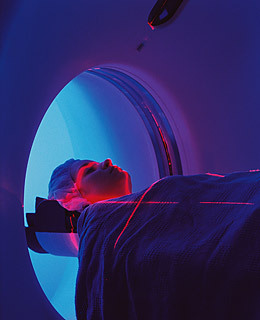 CT Scans: Just How Safe Are They? Computed tomographic (CT) scans help doctors zoom in on everything from head trauma to kidney stones. But some researchers are worried that unnecessary scans may increase your lifetime cancer risk. Long-term studies investigating a tumor connection are under way, but in the meantime, patients may be getting some serious radiation exposure. A study of 1,243 randomly chosen hospital patients showed that, on average, they had been exposed to 45 millisieverts (mSv) of radiation (the typical chest X-ray delivers 0.02 mSv), and 12% had been exposed to more than twice that amount. And not all of this exposure may even be necessary. Earlier studies have suggested that some doctors order duplicate scans, while others prescribe CTs in an abundance of caution, just to rule out potential diseases.